Now that you have purchased your plants at our FloraKansas plant sale and hopefully gotten them planted in your landscape, you’ll want to be intentional about watering methods. 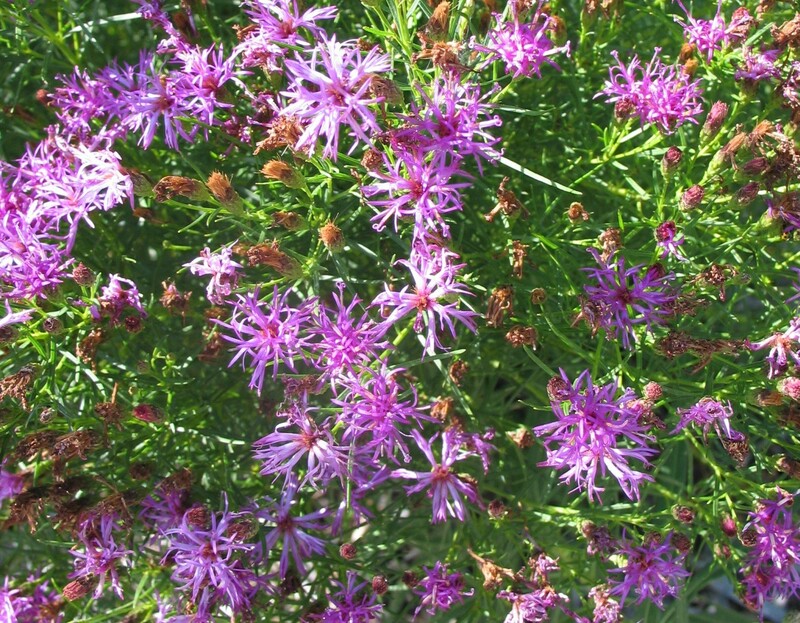 It’s true, native plants are more drought-tolerant than you may be used to. However, in order to get your plants successfully established, they will still need some careful attention these first few weeks and through the summer. When planting: Water plants as soon as you get them in the ground. Allow the water to soak in, then water again until the soil is thoroughly moistened. First Two Weeks: Water plants daily depending on the weather. If it rains, skip a watering. Just-planted roots are only able to absorb soil moisture from the potting soil. They have not attached to their surrounding soil. When you see new growth, the plants have begun to get established. First Month: Unless the weather is extremely hot and dry, you may be able to decrease watering frequency to two or three times per week. Generally, you want the soil to be dry an inch or two below the surface before you water. Too much water leads to foliar and root problems. It is optimal to allow the soil to dry between watering because this encourages roots to grow deep. Following Months: Water only when top inch or two of soil dries or when plants display signs of being dry. Water deeply and infrequently. How much water will depend on your soil and environmental conditions. Don’t forget to check your plants during the winter months. Water deeply as needed. During prolonged periods of dry weather water once or twice per week. Generally, it takes plants at least two years to fully develop a sustaining root system. Properly planted and watered plants should be fairly well established, and can thrive with less watering than you may expect. Drought-tolerant plants may need no supplemental water, whereas shallow-rooted plants or plants with greater water needs may need water weekly. Many plants, when selected for the conditions in your yard, may need watering only once or twice a month in dry weather. Drought-tolerant plants: Even drought-tolerant plants need regular water until they are established! Young Trees and Shrubs: Young trees and shrubs need deep regular watering. During times of little or no rain, water deeply once a week until trees become established. Fertilization: Don’t fertilize new plants. Fertilizing during establishment encourages rapid top growth that is not sustainable by the root system. Mulch: Mulch new plantings with 1-3 inches of mulch and keep mulch away from plant stems. Water in the morning: Less water is lost to evaporation. Choose the right watering method: A soaker hose applies water directly to the soil and reduces evaporation. If you are planting a few plants in an existing planting bed, hand watering can get the new plants the water they need while not overwatering the rest of the bed. Get to know your soil: Is your soil sand or clay? It greatly affects watering frequency and duration. Our clay soils can only take in about an inch of rain per hour. Check soil moisture before watering: Check soil moisture with finger or spade. Soil should be dry an inch or two below the surface before you water. Recheck soil after watering: At least an hour after you water (or two hours with clay soil), probe soil to see how deeply the water penetrated. If it didn’t reach the root zone, you may need to increase your watering. If the area is soggy, try cutting back on watering next time. Pick the right plant for the right place: Choose plants that are pest-resistant, require less water, and match the sun, shade, and soil in your yard. Avoid planting in hot, dry weather: Plants will easily stress and not develop healthy roots under hot, dry conditions. If you must plant in summer, plant in the cool of the morning when less water is lost to evaporation. There is always that area in your landscape that is shaded. These areas can be frustrating, because they don’t grow turf well leaving the soil bare. Here are a few good shade plants to spruce up that dark corner of your garden. Delicate but tough wildflower for the shade garden. Flowers are red with yellow that bloom in April and May. Plants ultimately reach 12-24 inches tall in part-shade to shade. They are quite adaptable, but prefer an average to moist soil. This sedge looks like it came straight from the 80’s big hair days. The punked out spikes reach 12 to 18 inches straight up in any shade garden. 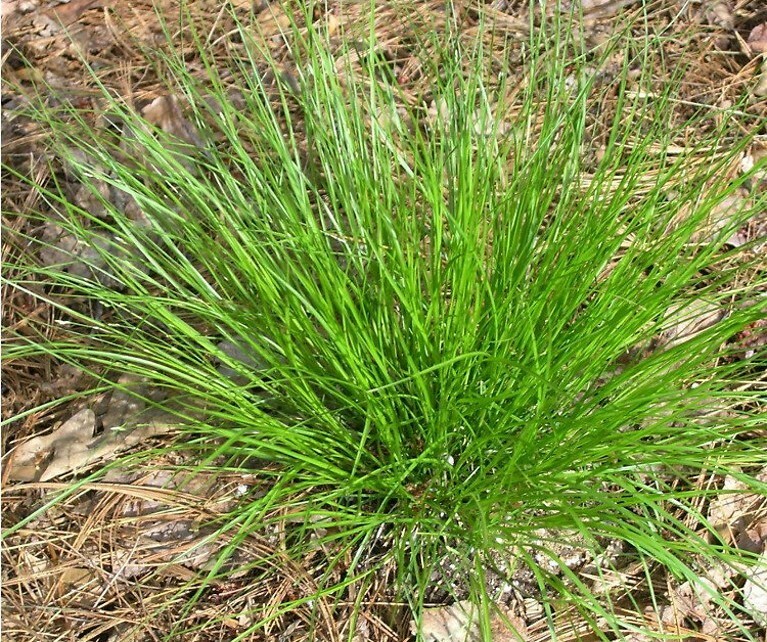 This lovely sedge is native to dry woods. Its fine texture and fountaining habit make it a lovely groundcover in dry shady sites, even in the root zone of trees. This native phlox is a favorite spring wildflower. It can be found along streams and in open woods. The 12 inch clumps are covered with delicate 1.5 inch lavender flowers in May. Quick to fill in areas when happy, it requires little or no maintenance. Photo courtesy of Walters Gardens. 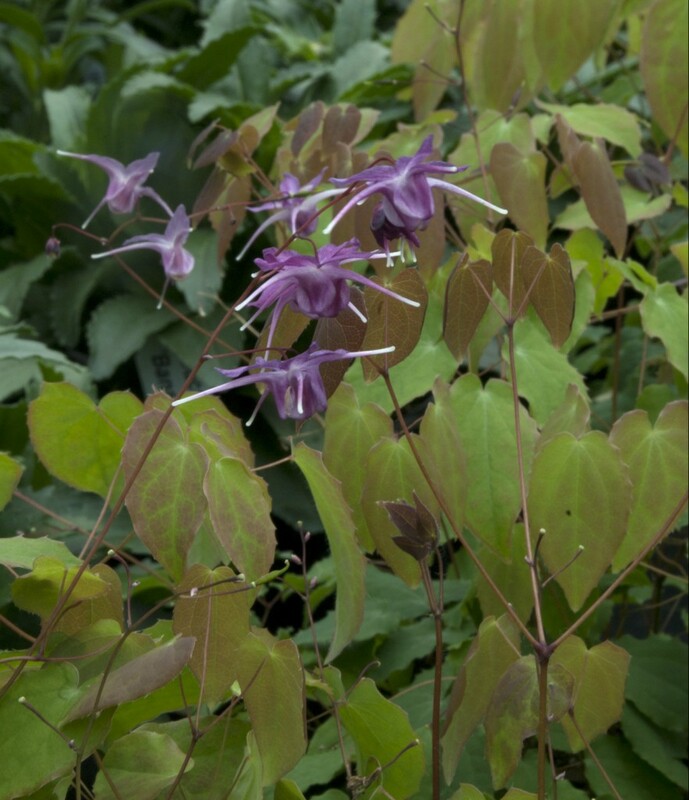 This dwarf Epimedium grandiflorum is one tough cookie in the landscape. In mid-spring, the new ear-shaped foliage emerges with a dramatic bronzy-lavender color. The delicate violet flowers dance above the heart-shaped foliage. This nice selection for the woodland border has pure clean white flowers atop the mahogany stems. It blooms in September and October, adding splashes of color to your shade garden later in the season. 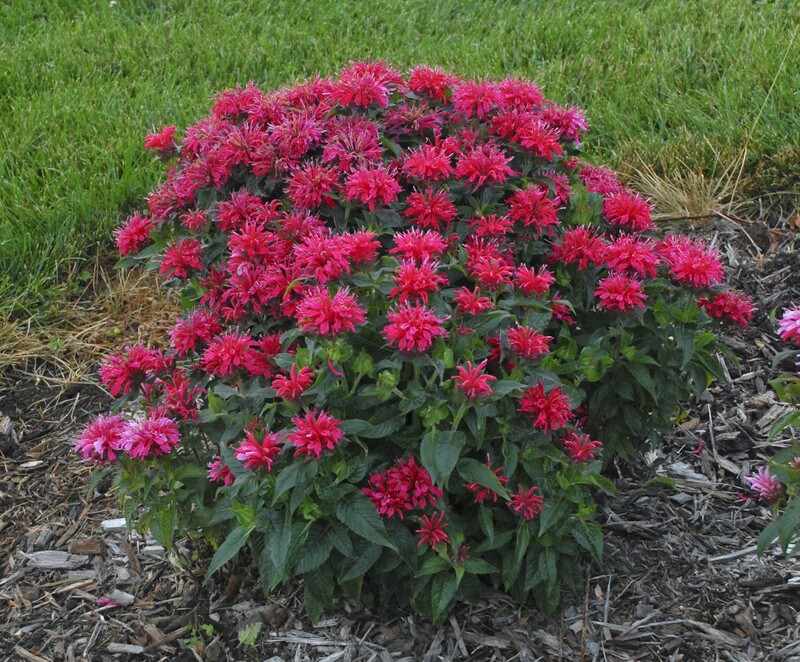 It prefers part-shade to shade in an average to moist soil. It is a weaver that slowly fills open areas, but it is not aggressive. One of the themes this spring for planting is diversity. By planting a diversity of wildflowers and grasses in your garden, you will attract many different forms of wildlife, including pollinators and birds. A wide variety of plants blooming at different times of the year will provide interest and beauty throughout the growing season. As we have been busily getting ready for the plant sale this week, I can’t help but notice the diversity of plants available this spring. There are so many wonderful plants to choose and incorporate into a landscape setting. This is the 2015 Kansas Native Plant Society wildflower of the year. It grows 18 to 24 inches tall with green flowers in May and June. It loves full sun and thrives in dry prairies. Monarchs use milkweeds as a host plants. 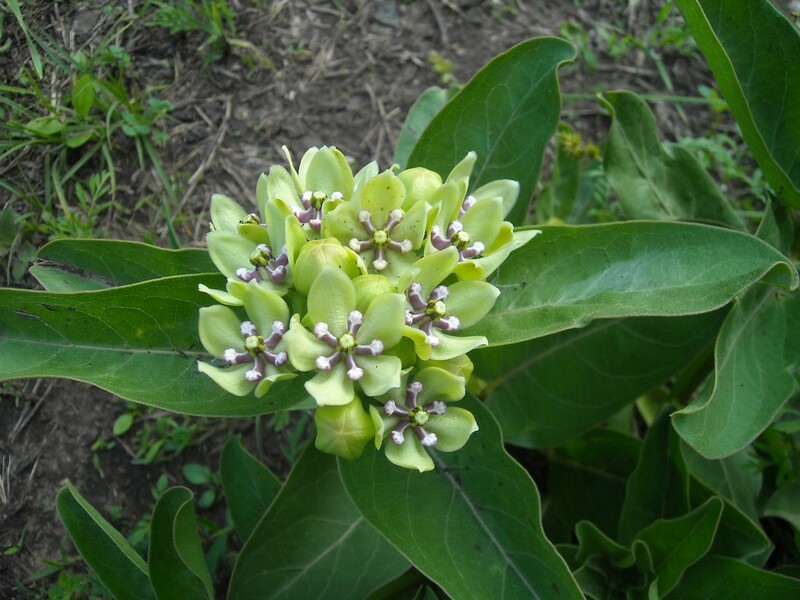 Grow this species or any other milkweeds to increase habitat for the perilous populations of monarchs. It is beautiful in flower and foliage. In early spring, the whitish-pink tubular flowers emerge. Bees and even hummingbirds flock to these flowers to sip the sweet nectar. Not only is it attractrive when blooming but the maroon-purple foliage adds interest the rest of the year. 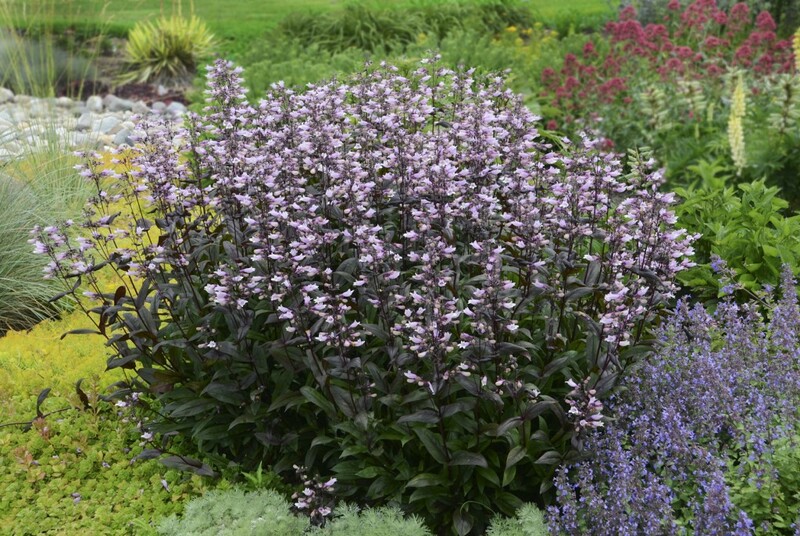 A plant for the front of a border that is attractive at many different seasons of the year. I was blown away by this grass last summer. It looked fantastic with the airy golden flowers all summer. The horizontal eyelash-like flowers wave in the wind atop the fine blue-green foliage. 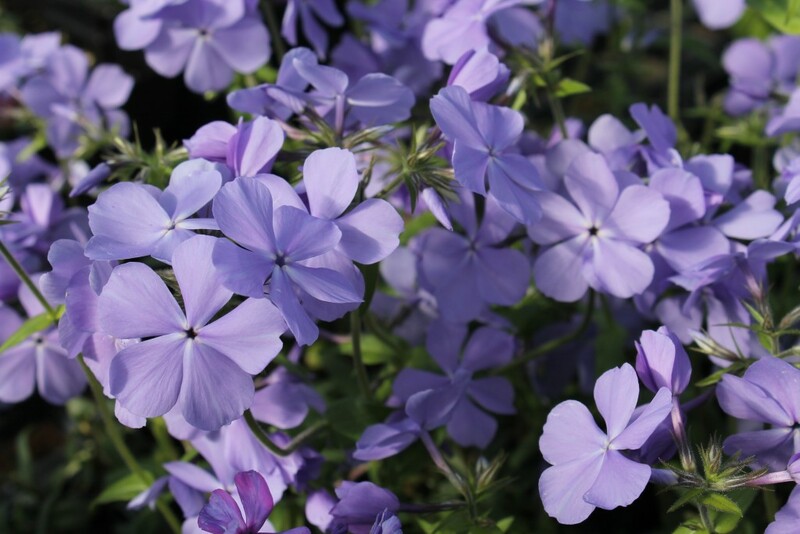 It grows effortlessly in any sunny site and just about any soil. 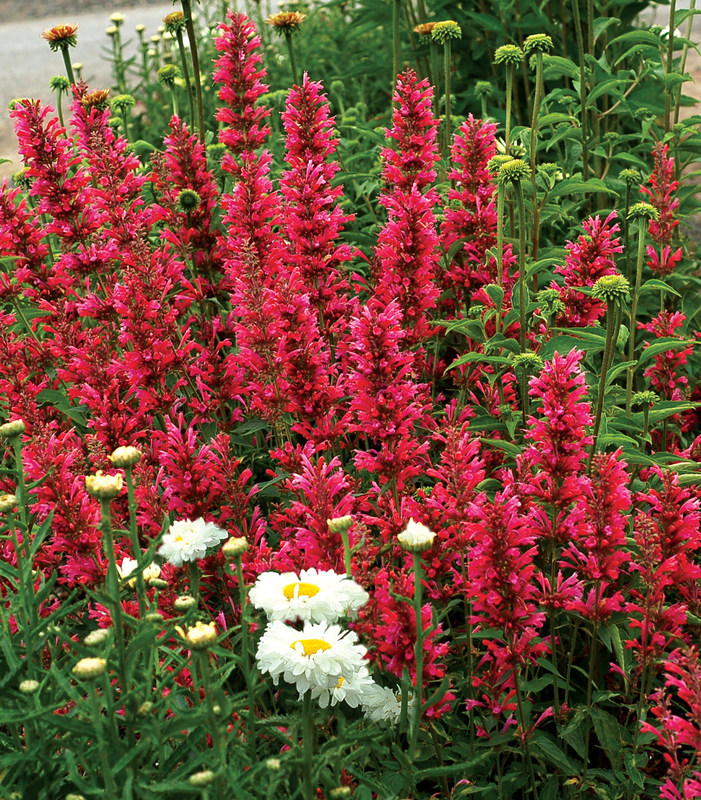 Great in mass plantings or along borders edges. Quite the dramatic, unique grass. I have grown to appreciate the toughness of this wildflower. This selection found in Arkansas has fine foliage like Amsonia hubrichtii but stays more compact. The dark purple flowers cover the entire plant in late summer attracting pollinators by the herd. It thrives in hot dry locations. When other plants are wilting, it is performing like a champ. I have put this plant on my top ten list just about every year because it is a great plant. Sky blue flowers in spring develop atop stems with narrow leaves that whorl the stem. Each plant can grow about three feet tall and three feet wide. 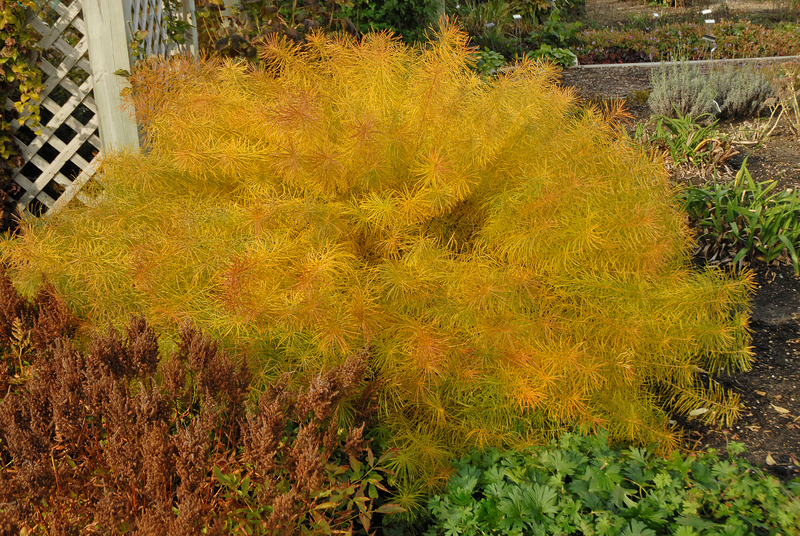 The real show is in the fall as the entire plant turns a beautiful golden yellow. Plant in mass or alone in the middle of the border. A garden worthy plant that should be used more. This is a new and improved form of native Little Bluestem. It colors up beautifully in the early fall but the iridescent silver-mauve foliage from spring to fall is eye-catching. Growing stiffly upright, this grass reaches three to four feet tall by the end of summer. Plant as a backdrop for other perennials because the foliage is a wonderful complement. 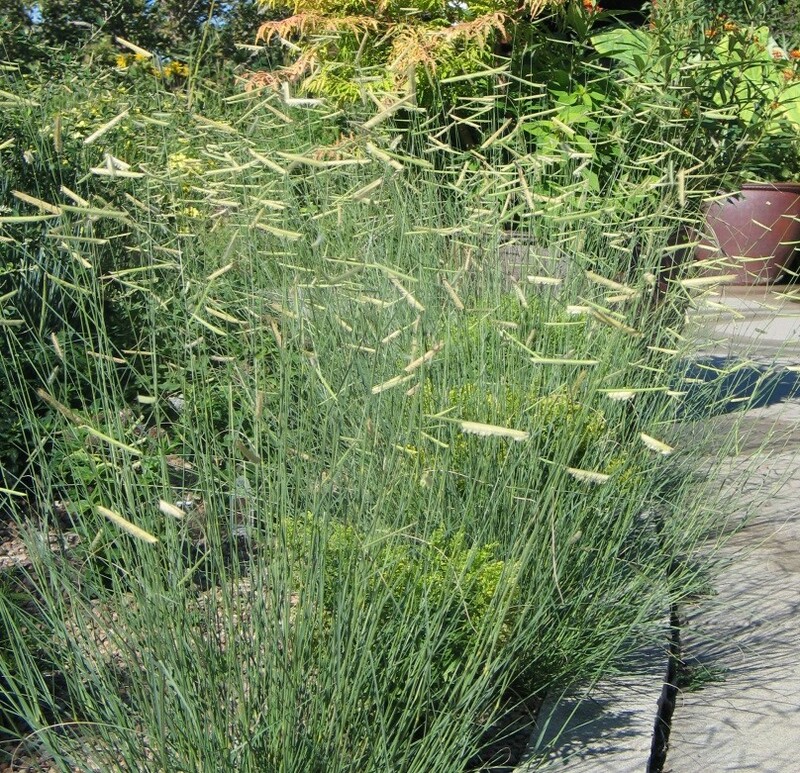 Great native grass for interesting foliage and form. Photo courtesy Terra Nova Nursery. What an awesome perennial! The large, dark raspberry pink blooms cover this plant all summer and into fall. Pollinators flock to the blooms and make the plant come alive with activity. Plant in full sun and well-drained soil. 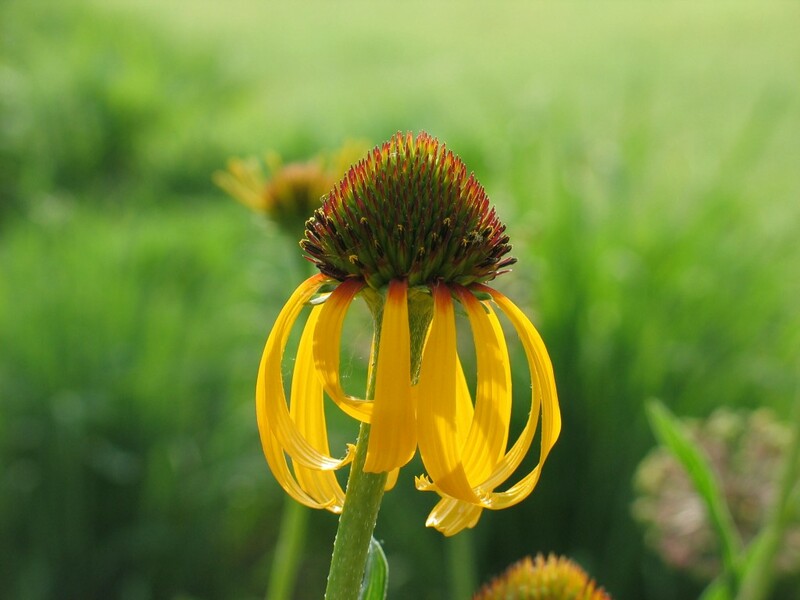 A yellow purple coneflower is a paradox. However, it is tough and beautiful. The flowers emerge in May and June with long yellow ray petals. It grows best in full sun, ultimately reaching 3-4 feet tall. 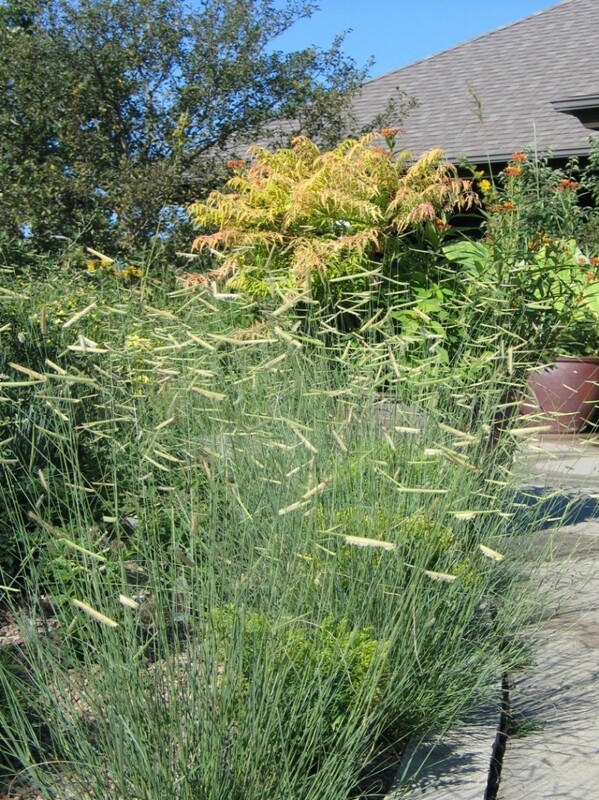 Mix with native grasses like Little Bluestem or Switchgrass to showcase the attractive seedheads later in the year. Goldenrods get a bad rap for causing allergies. 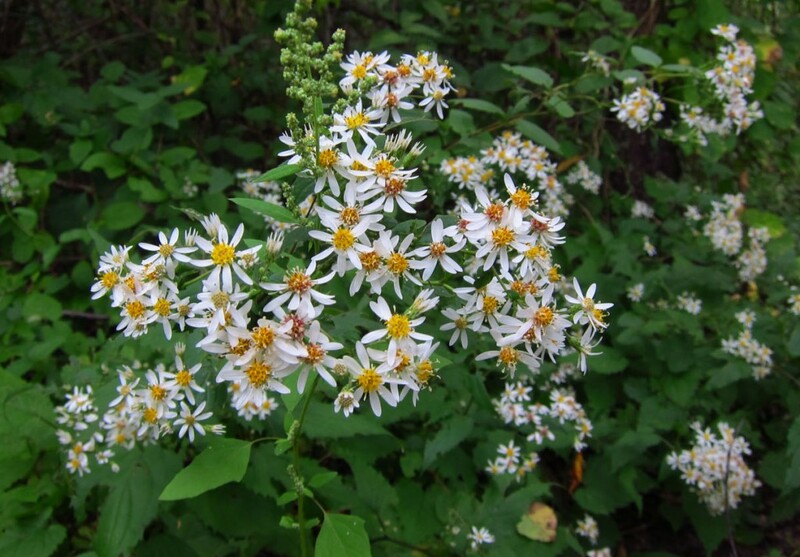 Actually, they don’t cause your allergies in the fall – that is the fault of the ragweed pollen instead. 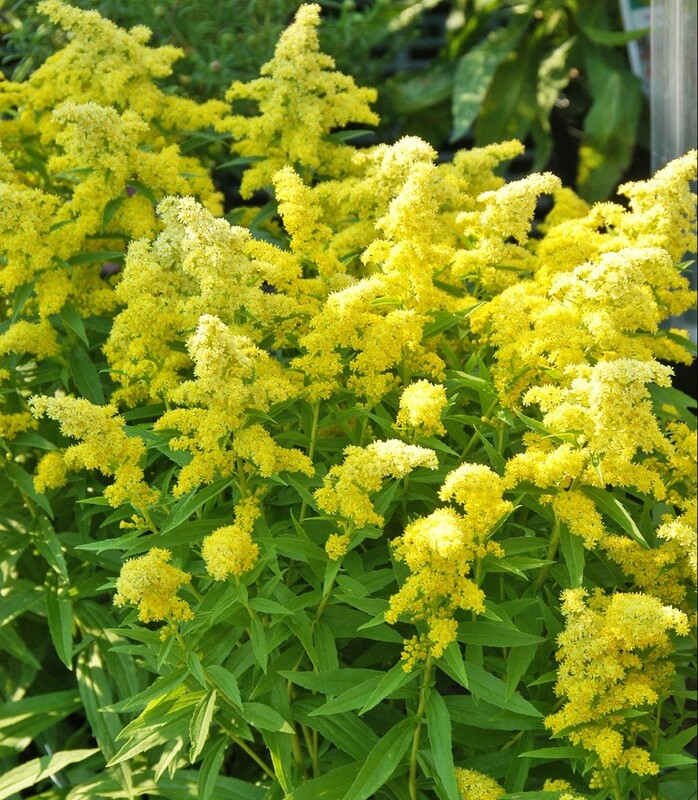 So now that you know that tid-bit of information, you can plant this dwarf goldenrod in your garden. 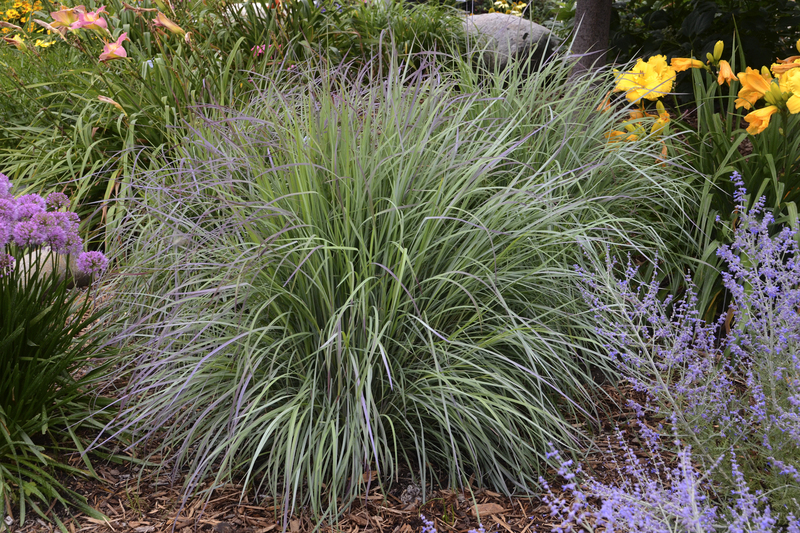 It grows to 12 inches tall and mixes well with short grasses along a border or edge. Plant in full sun for best results. Brilliant cherry-red flowers cover this new bee balm in midsummer. The well-branched plants have clean mildew-resistant foliage creating a compact mound. Each nectar sweet flower attracts hosts of pollinators throughout the summer. Great new form for the front of a border or along a sidewalk. It is time to get these plants in the ground. The beneficial rains of the past few weeks have really got me itching to plant some of these varieties this spring. There are so many beautiful plants that are worth trying. Hopefully, you will have a chance to stop by the plant sale, take a look and give some of them a try in your own garden. 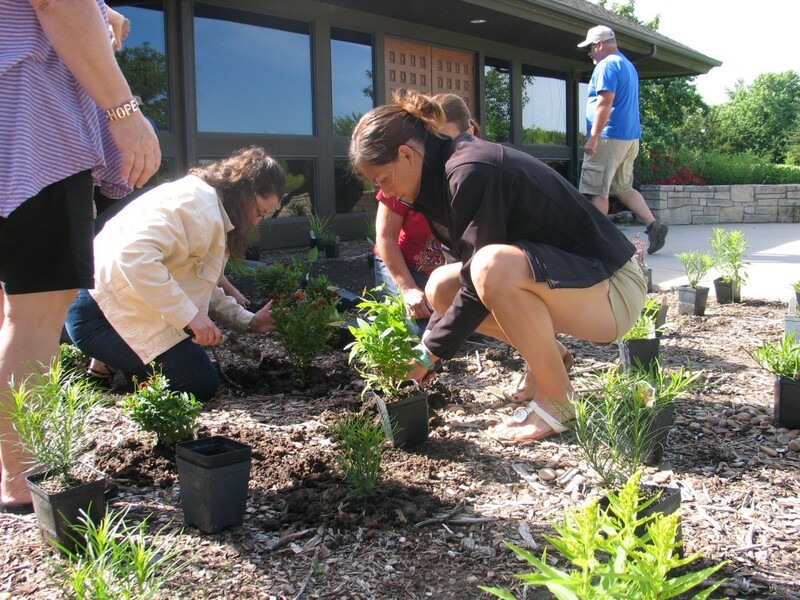 Interest in native landscaping is growing in popularity. This time of year leading up to our spring plant sale, homeowners and businesses contemplate what they would like their landscape to look like. They desire a garden that captures the essence of the prairie, a landscape that creates a sense of place. Nature gives us such a good model to follow. The diversity and resiliency of native wildflowers and grasses is amazing. 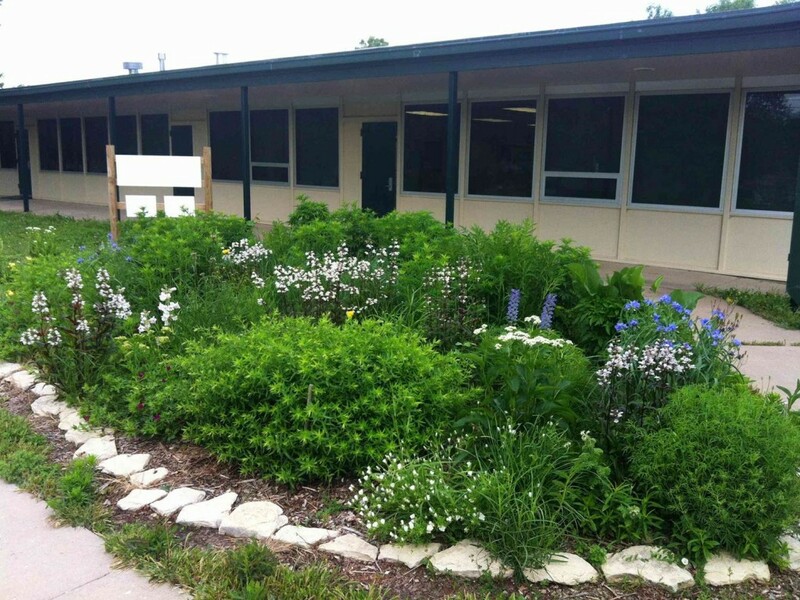 We can mimic the prairie and bring it home to our gardens. Follow these seven steps as you develop a plan using native plants. 1. Plants should match your site. This is the most important element in developing a successful landscape. 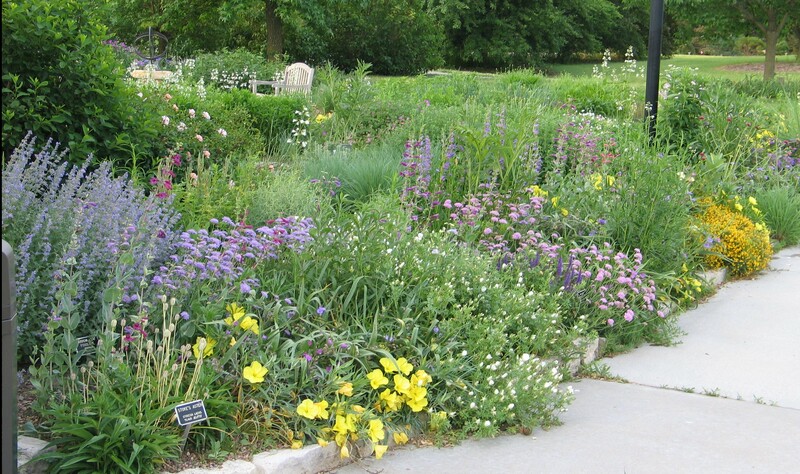 Take a critical look at the area you want to landscape with native plants. Is it sunny? It is shaded for part of the day? What type of soil do you have? Is there a microclimate? Is it exposed to wind? All these factors will guide you as you select plants for your site. This step requires some research and time as you familiarize yourself with the qualities and environmental needs of native plants. There are no Wave Petunias in the prairie. 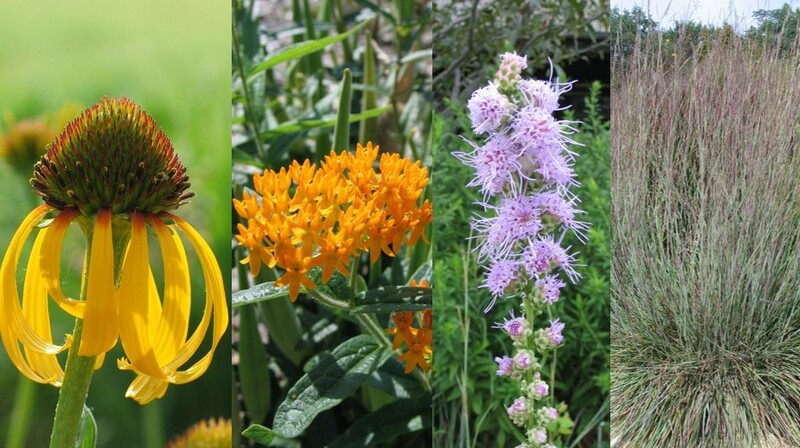 If you visit a prairie landscape like the Konza Prairie every two to three weeks throughout the year, you will observe plants beginning to bloom, in full bloom or going out of bloom. That is how you need to design your native landscape. Include plants that bloom in every season of the year and then strategically add grasses for movement and texture in the winter months. Again, take time to acquaint yourself with the life cycles of wildflowers and grasses. A diversity of plants woven together artistically can create a dramatic effect. Pay attention to the various shapes, textures and colors present in the prairie. Notice how the plants look year-round, not just when they are in bloom. Highlight interesting plant characteristics such as seed heads, forms, and fall color. Rock Edging or a clean line along your display bed and lawn can add visual interest. It can also lead you through your garden. Interesting lines lead our eyes and makes you want to see what is around the corner. Plant the colors you like, but make them complement each other. 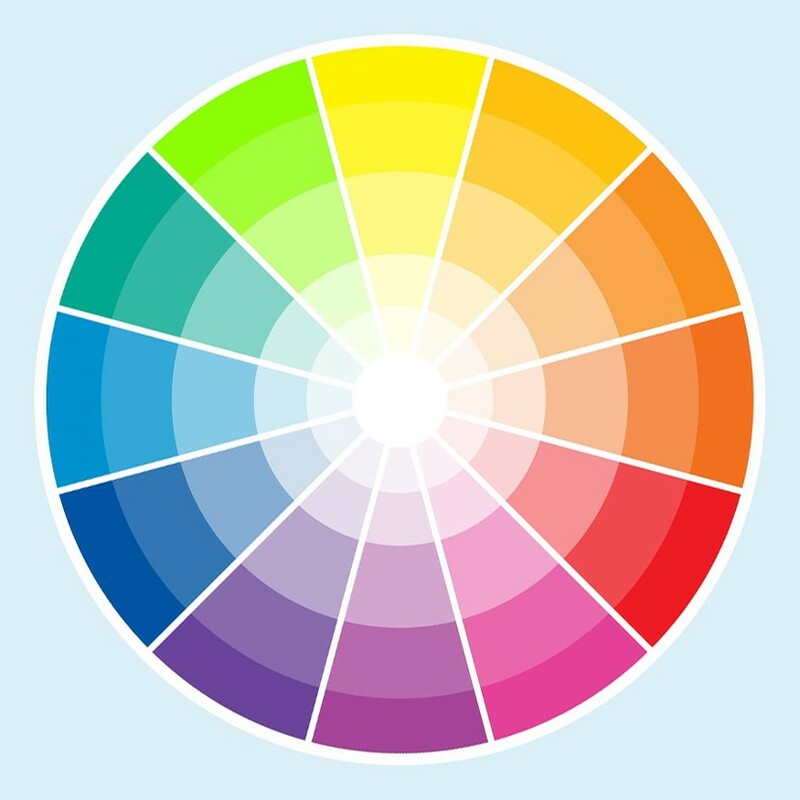 Use a color wheel to mix plants. Example: Purples (Spiderwort) and yellows (Coreopsis) are attractive together because they are opposite on the color wheel while whites (Penstemon) harmonize/blend the landscape together. Are there areas that need screening? Is there an opportunity to layer plants from shortest to tallest as a foundation planting? Is it an island bed that has taller plants in the center with shorter wildflowers and grasses radiating to the edges? Keep plants in scale by not planting wildflowers that are taller than half the bed width. Example: If your bed is six feet wide, only plants that are three feet tall will keep the display in scale. You would not want to plant a compass plant is such a small bed. I have made this mistake too often. In a rush to plant, I don’t get problem weeds like bindweed and Bermudagrass under control before planting. I am still fighting this issue to this day in some of these landscape settings. However, when I take the time to properly eradicate these weeds, the overall success of the garden and work to maintain it long-term greatly increase. A little work at the beginning will save you many headaches down the road. 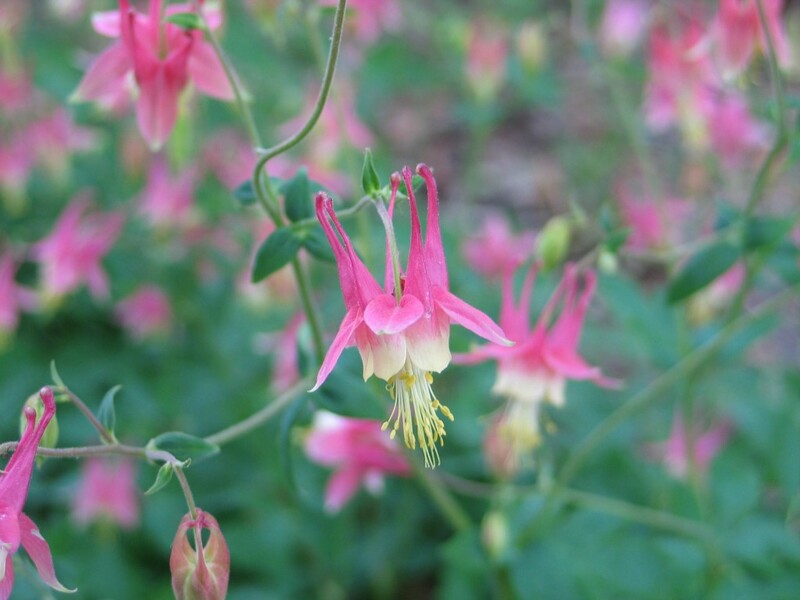 If you have questions about native plants or need help choosing what plants will grow best in your area, visit our spring plant sale or choose from landscape designs on the website. 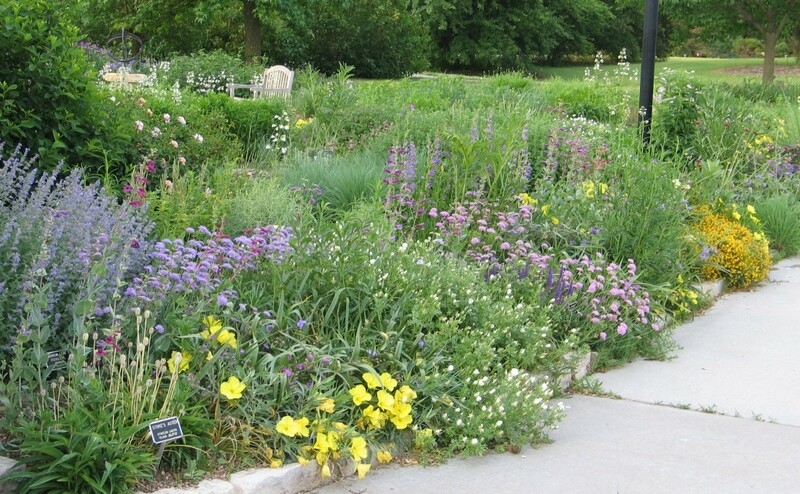 With proper planning and careful consideration, you can create a sustainable garden utilizing native plants adapted to your landscape environment. 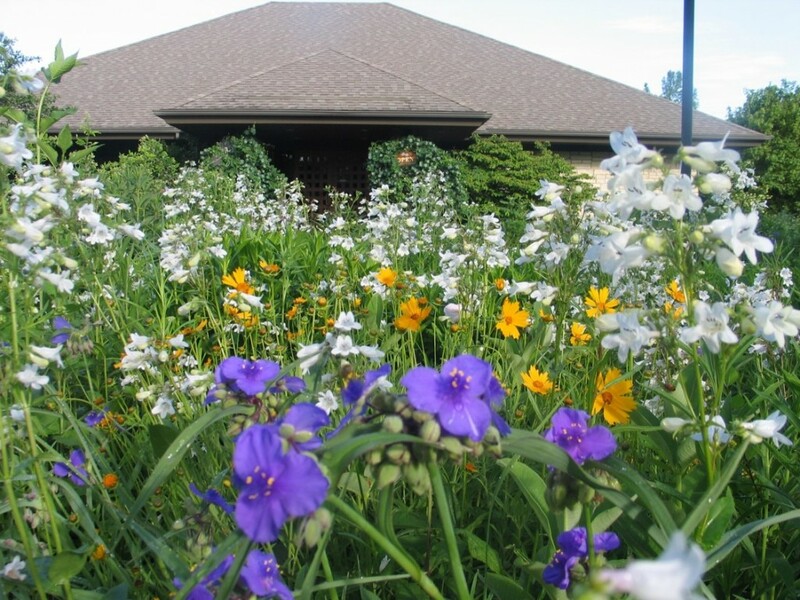 Transform your landscape using native plants that are sustainable, easy to maintain, and beautiful. Every spring I marvel at the changing landscape, especially prairies that have been burned. A seemingly lifeless and brown prairie is turned black by fire and reduced to ashes. This important process removes last year’s growth, allowing the sun to warm the soil. This warmth is just what native wildflowers and grasses need to emerge from their winter slumber. They jump to life in just a few warm days, turning the charred plains emerald green. In this new growth, there are some very recognizable plants that stand out. Indigos rise from rocky hillsides and dot the landscape in early spring with beautiful blue, white and cream flowers. They thrive in challenging environments because of their deep roots. The roots of wild indigos can be quite extensive – reaching down over ten feet deep – making them impervious to drought. Locally, only two varieties of indigos grow in the prairies of south-central Kansas. Blue False Indigo (Baptisia australis var. minor) has a stately posture. The entire plant is stiffly upright and forms a miniature canopy with the attractive blue-green foliage. The showy spires of small pea-like blooms develop in May. Later in the season, oblong brownish-black seed pods emerge providing another highlight to this beautiful wildflower. They love any sunny spot with well-drained soil. They are difficult to move once established because of the deep tap roots. 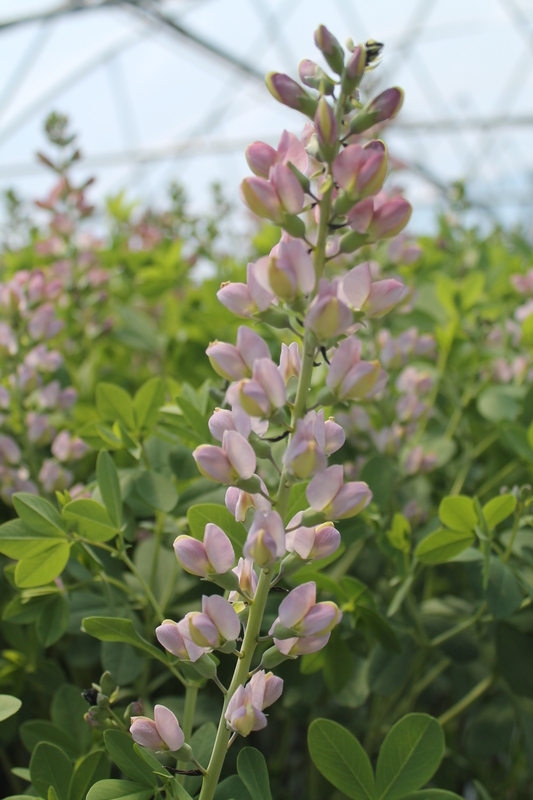 Cream Wild Indigo (Baptisia bracteata) is the other indigo found in our area. It is one of the earliest wildflowers to bloom. 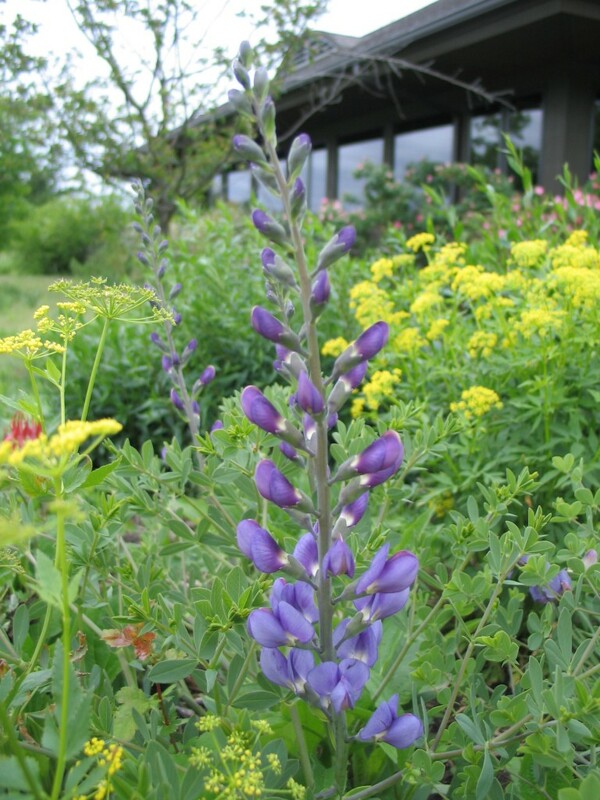 In fact, one of the plants outside the Visitor Center is showing flower buds now, in the first week of April. The creamy-white flowers are held horizontally to the ground in long prostate clusters. Again, these flowers turn into brownish-black seed pods filled with small beans. The entire plant has a fuzzy appearance from leaves to the stem. They are tough and drought tolerant when planted in a well-drained soil with full sun. 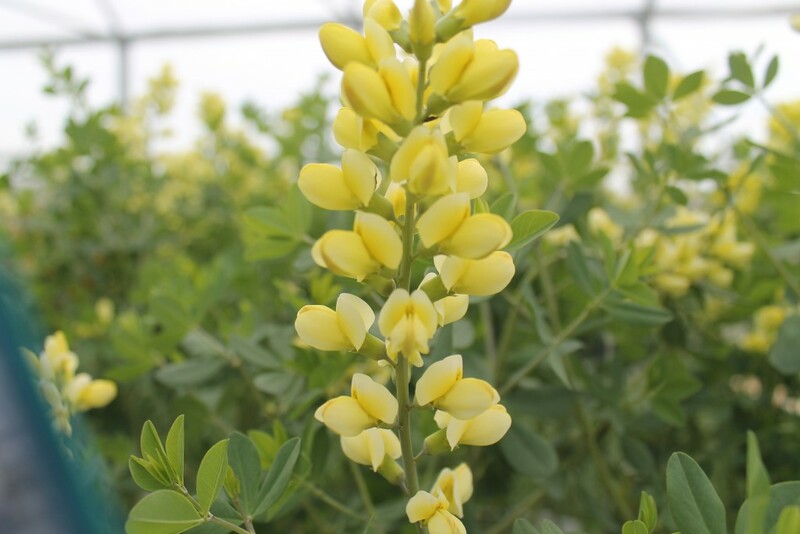 Other nativars (cultivars of native plants) worth trying are Baptisia ‘Blue Berry Sundae’ Blue flowers, 24-36 inches tall; Baptisia ‘Cherry Jubilee’ Maroon/yellow flower, 30-36 inches tall; Baptisia ‘Lemon Meringue’ Lemon/yellow flowers, 36 inches tall; Baptisia ‘Vanilla Cream’ Pastel yellow flowers, 24-36 inches tall; Baptisia ‘Indigo Spires’ Dark Purple flowers, 36-48 inches tall; Baptisia ‘Blue Towers’ Blue flowers, 48-54 inches tall; and Baptisia ‘Pink Truffles’ Pink flowers, 30-36 inches tall. All of these varieties will be available at our upcoming plant sale in just a few weeks time. 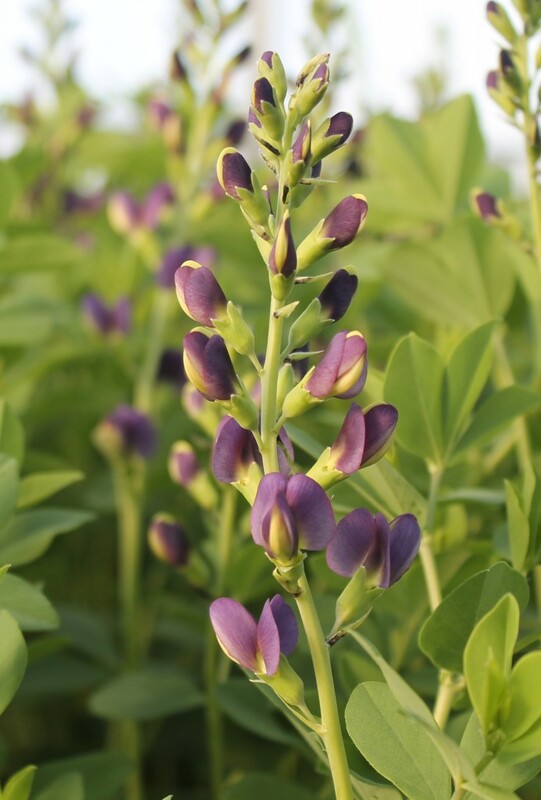 I have always been enamored with Baptisia. They are so resilient. They effortlessly survive in the toughest conditions. To see a whole prairie dotted with indigos as far as the eye can see is amazing. The stunning beauty of these wildflowers can be brought home as well. They adapt to any sunny landscape setting. I can’t resist their charm and beauty. 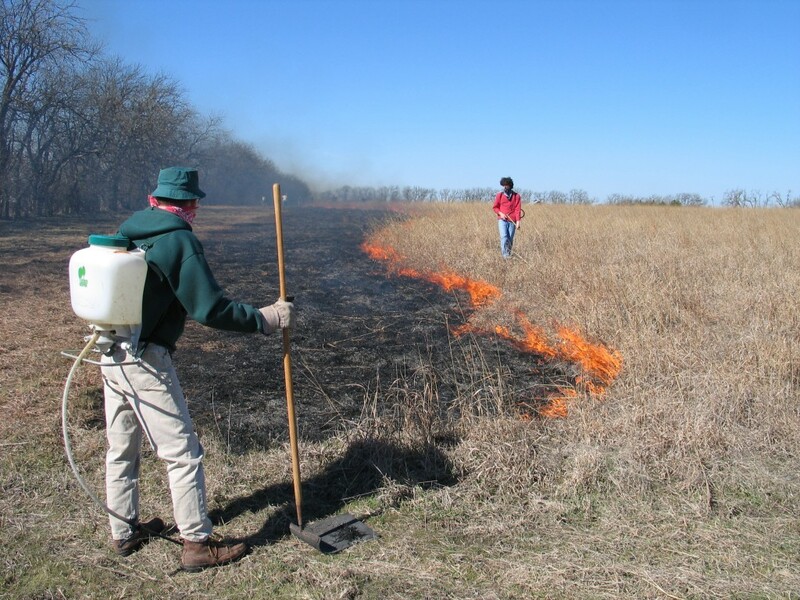 An important disturbance mechanism for prairie ecosystem health, a restoration ritual that connects a Kansan to its native landscape, and a series of sights, sounds and smells that both comforts and stirs heightened senses – prairie burning in the spring represents all these things to me. 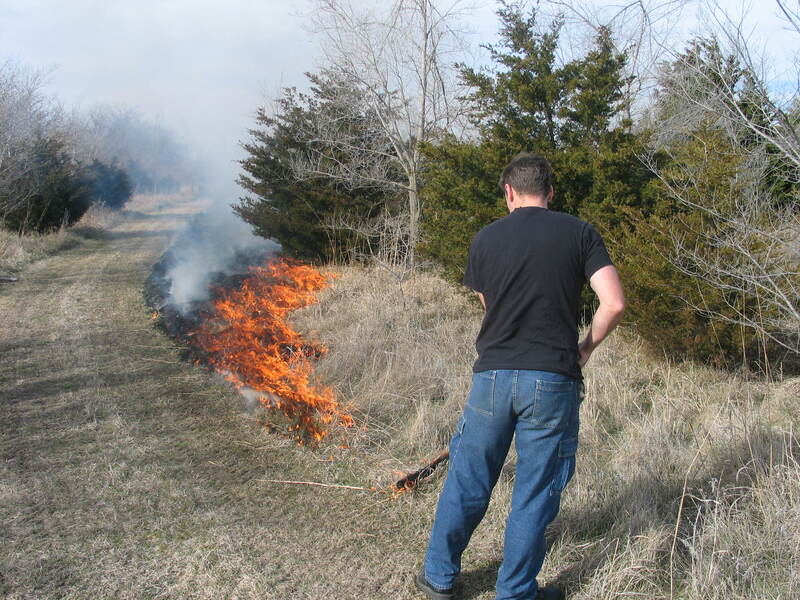 Ever since participating in my first prairie burns during graduate school in Wisconsin, where I was trained to safely conduct prescribed burns, I have held a great reverence and respect for this process of igniting the prairie. Prairies and a whole array of plants and animals became adapted to semi-regular lightning-set fires on the Central North American Plains since the last ice age approximately 10,000 years ago. In the last couple of thousand years, humans have also been important vectors for bringing fire to the prairie and helping determine its geographic extent on the landscape. Native Americans used fire to clear safe zones for lodging, attract or direct wildlife for food, and celebrate cultural rituals. Their actions helped extend prairie further east into areas that have since reverted back to oak-hickory forests, as the Native American presence and their fire rituals were extinguished. European ranchers on the Plains hold a similar respect for fire and use it to help fatten cattle and control invading woody plants that would eventually shade out prairie grasses. 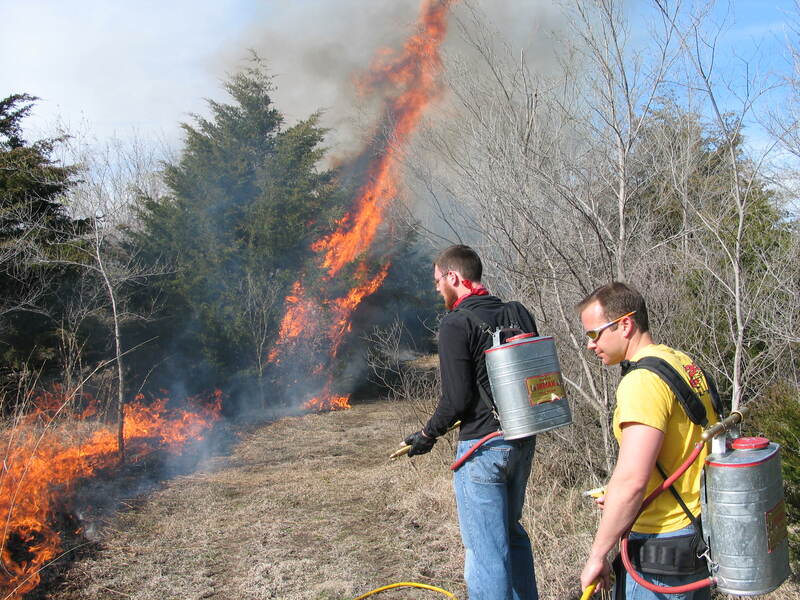 Prairie fires in Kansas have been met with resistance. Increased human habitation and careless use of fire in untamed wild places puts residences more at risk and created an understandable fear of fire. Air quality problems affecting human health, due mostly to automobiles, power generation and industry in major metropolitan areas like Kansas City and most recently Wichita, are certainly not helped by spring prairie burns. Wildlife managers can cite that annual prairie burns in the Flint Hills have become too frequent for the success of grassland birds, including greater prairie chickens that require some residual cover for adequate foraging and nesting success. Kansas has a rich history intertwined with the prairie and Kansans embrace prairie as an important part of our cultural and natural history, our recreation through eco-tourism (state park use, hunting, fishing, birding, hiking, etc.) and our economy (ranching). Where prairie has been removed, it has left behind a legacy of some of the best agricultural soils in the world. 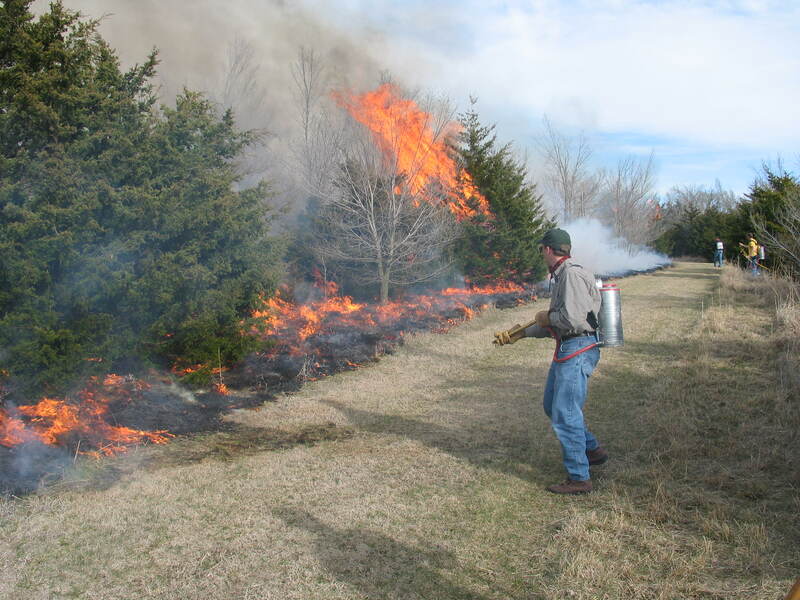 While mowing does provide some of the benefits of fire, it does not provide all of them, and is more costly and time-consuming. We must find ways to utilize and implement prairie burning with greater safety, intelligence, and purpose. 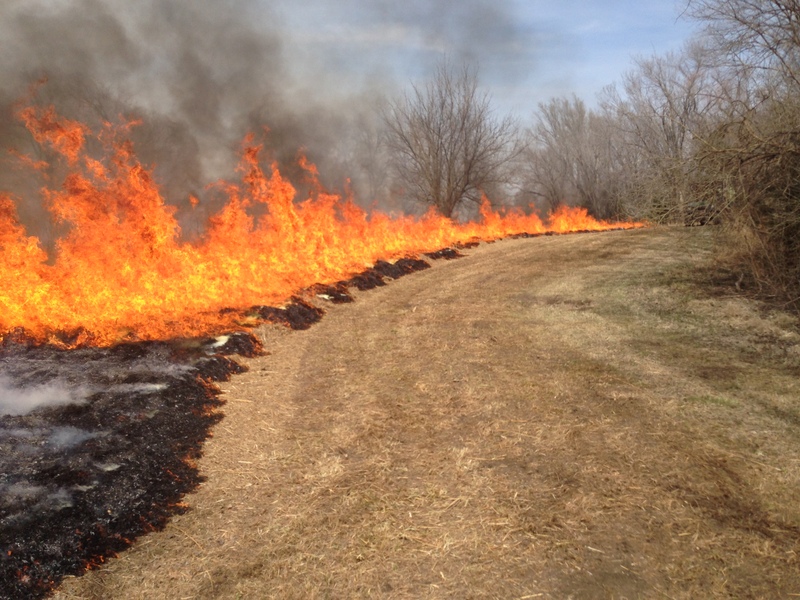 Simply put, a culture that values prairie must also value fire.